With as many as 66% of UK consumers considering smart homes an appealing concept*, homeowners are increasingly looking to manufacturers and suppliers for new ways to control – and connect – their household gadgets and devices. 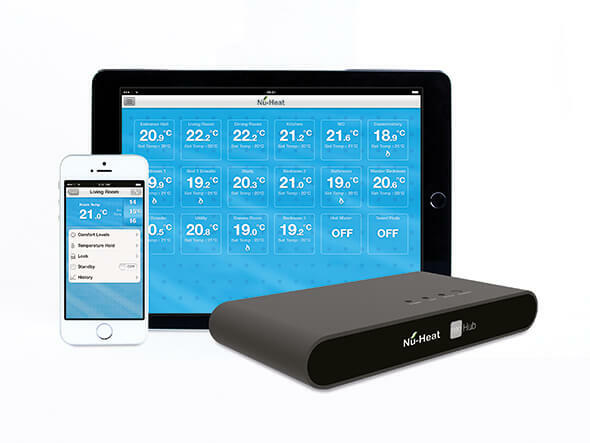 We are pleased to announce that you can now use Apple HomeKit home automation technology to control your Nu-Heat underfloor heating system, when you choose any neoHub+ smart control package. There are no contracts or subscription fees, and you can easily configure HomeKit control of your Nu-Heat underfloor heating in a few simple steps. Nu-Heat’s neoHub+ responds to Siri and the Apple iOS10 Home app, giving you the option to set and adjust heating temperatures via the Apple Home app or Siri voice control. You can also set HomeKit automations and remotely control your heating settings in conjunction with any other HomeKit compatible products you may have in your home. How do I get Apple HomeKit? Apple HomeKit functionality is available with any Nu-Heat underfloor heating system with a neoHub+, which now comes as standard with any of our smart packages. Speak with one of our underfloor heating experts on 01404 549770 to find out which heating system and smart package is right for you. Already have a Nu-Heat underfloor heating system? Contact us on 01404 549770 or via info@nu-heat.co.uk to find out how you can upgrade to Apple HomeKit technology. Nu-Heat’s new acoustic underfloor heating (UFH) solution, produced in partnership with Knauf and Thermal Economics, will be showcased at EcoBuild this year. AcoustiPanel®14 comprises a pre-routed gypsum board over a high performance IsoRubber-UFH-NH base, into which Nu-Heat’s 14mm Fastflo® tube is neatly installed. 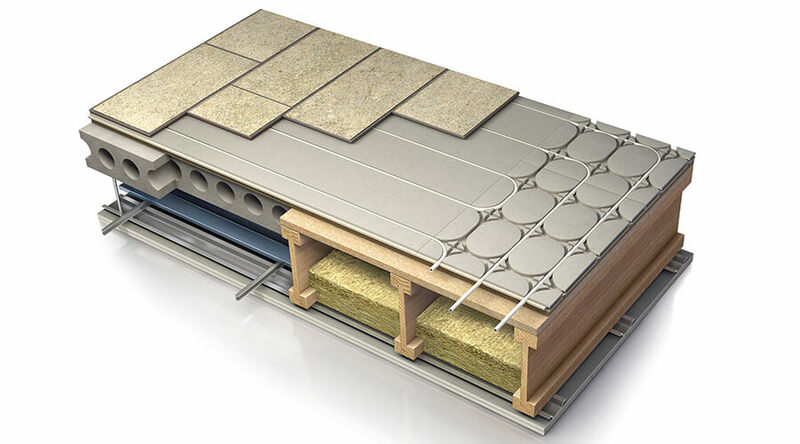 When installed as part of an acoustic floor cassette, AcoustiPanel®14 with 5mm IsoRubber-UFH-NH has been proven to reduce airborne and impact sound transmission through suspended timber floors, assisting in exceeding Part E compliance standards. The system is suitable for new-build and renovation apartments where an efficient and discreet underfloor heating solution is required as part of an acoustically robust system. The combination of tongue and groove panels and self-levelling skim offers high thermal conductivity, allowing quick transfer of heat into the room as well as an extremely stable and level floor. As a low profile, acoustic solution with outstanding performance AcoustiPanel®14 provides a sustainable, high quality, fit-and-finished floor section. Installation of the routed panel is simple and similar to that of a typical tongue and groove deck, and the thin skim coat dries overnight with no impact on the site programme. 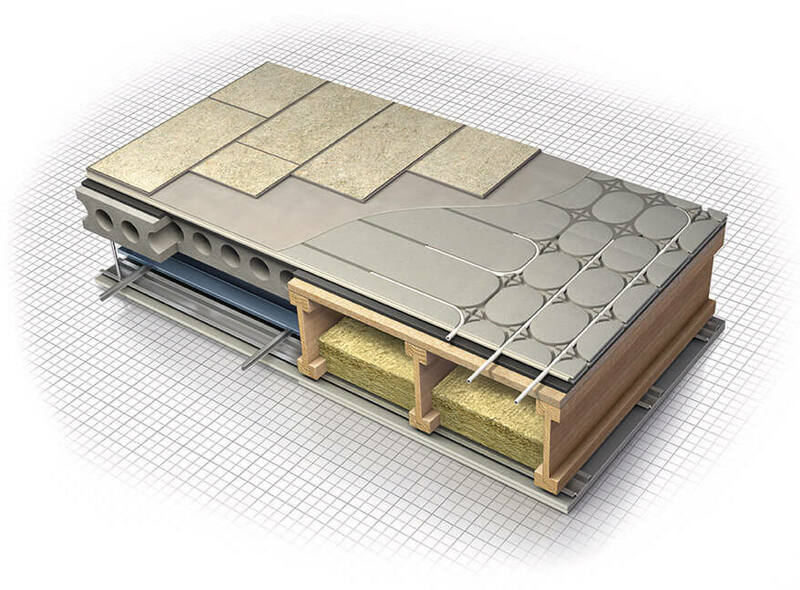 Combined Knauf acoustic floor deck solution with integrated Nu-Heat warm water underfloor heating. This new acoustic solution from Nu-Heat, produced in partnership with Knauf, comprises a pre-routed gypsum board over a high performance IsoRubber-UFH-NH base, into which Nu-Heat’s 14mm tube is neatly installed. The combination of tongue and groove panels and a self-levelling skim offer high thermal conductivity allowing a quick transfer of heat into the room and the creation of an extremely stable, monolithic floor finish. 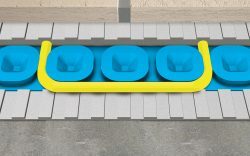 When installed within an acoustic floor cassette, AcoustiPanel®14 exceeds Part E making the solution suitable for new build and renovation apartments, where an efficient and discreet underfloor heating system is required as part of an acoustically robust system that is simple to install. Timber Expo is the most important timber event on the UK construction calendar and is brimming with the latest products, innovations and developments across the timber sector. It runs from Tuesday 6th – Thursday 8th October 2015 at the NEC in Birmingham. Our experts will be on stand T3/435 to give you advice and guidance on integrating underfloor heating, including new AcoustiPanel®14 into your project. Get your free tickets to Timber Expo here.